Although it was common knowledge that the local Recreational Equipment Inc. (REI) store was the place to buy hiking boots and obtain topographical maps, the store was also a great place to find volunteers for the Hemlock Bluffs Nature Preserve. Owned by the state of North Carolina and managed by the town of Cary, Hemlock Bluffs is ecologically unique, with a system of north-facing bluffs and a wealth of eastern hemlocks. For years, biologists and educators had advocated protection and management of the bluffs. Before the trails were developed and town staff began to check on the site regularly, this area was being gradually degraded by random hiking, frequent bonfires, and littering. Today, only foot traffic is permitted on trails during hours of operation with no collection, removal, or disturbance of any natural objects allowed. The focus is on nature study and passive recreation. Hemlock Bluffs was added to the State Registry of Natural Heritage Areas and classified as a state nature and historic preserve in 1979. The town obtained a long-term lease from the state for most of the land in 1983, and trails, wooden overlooks, steps, and boardwalks were constructed in 1989. The nature preserve was dedicated in 1990, and the Stevens Nature Center was built in 1992. Each year, hundreds of environmental programs for all ages are offered on a variety of topics by the nature preserve staff. About 6 years ago, the town’s Parks, Recreation and Cultural Resources Department began presenting slide shows at the local REI on nature topics for REI members. Staff set up chairs and a slide projector in the middle of the tent and sleeping bag section. While there was never a “sell-out” crowd, we persevered. In getting to know the outreach coordinator at REI, park employees conducted more joint programs at the store and at the park. Then REI as an organization adopted National Trails Day as a service project. Although the town had been conducting an event each year in observance of National Trails Day, the event exploded the first year REI was involved. REI supported its employees in volunteering that day, rallied members to volunteer at the event, and provided free T-shirts, lunch, and plenty of free gear for volunteers. The event that typically welcomed an intimate group of 25 volunteers mulching a run-down trail quickly turned into nearly 100 enthusiastic outdoors folks who were willing to help in any way they could for 4 hours. Although we did the best we could, we floundered horribly. Each consecutive year since, however, the partnership with REI has grown and matured, and the event has improved. Since becoming involved with the local REI store, its employees, and the outreach coordinator, the trails day event has become one of the best local volunteer opportunities in the region. Nearly 5 years ago, when the national REI organization polled all of the stores for nominations for possible grant recipients, we submitted a grant proposal at the request of the local store. Over the following 3 years, the parks department received almost $35,000 for trail improvements, along with the promise of volunteers to assist in completing the work. Every board on the extensive boardwalk system has been replaced, along with every landscape timber on a long loop trail, and all of the trails in the nature preserve have been mulched—using primarily volunteers. REI funds also provided interpretive, educational signs and new trail-directional signs. The 20-year-old preserve has received a facelift, and what’s phenomenal is that visitors notice and comment on it. On June 1, 2013, Hemlock Bluffs staff members partnered with REI and the Friends of Hemlock Bluffs for the annual National Trails Day workday. 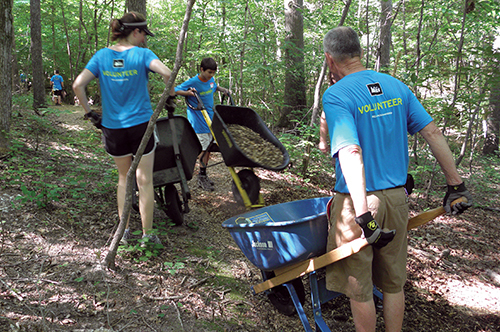 Ninety-two volunteers helped improve the trails, nature-center grounds, and the natural resources. Preserve staff and volunteers mulched almost 1 mile of trails and areas around the nature-center courtyard. Young volunteers planted flowers, painted the new cistern, and worked to beautify the recycle garden, while others cut and removed bamboo, hauled large pieces of trash from remote locations, and continued improvements on the gravel stairs. The Friends of Hemlock Bluffs provided lunch and purchased new tools for the day and other upcoming workdays. Partners are essential in providing additional support, promotion, supplies, and funding to park facilities. In these tight budget times, loyal partners who contribute year after year are incredibly valuable both in terms of program support and community involvement. Our partnership with the local REI store over the years has paid huge dividends in terms of volunteer assistance and grant funding. We are proud to cooperate with an organization whose mission aligns so neatly with ours. Laura K. White, CPRP, CEE, is the supervisor for the Stevens Nature Center in Cary, N.C. Reach her at Laura.White@townofcary.org or (919) 387-5980..